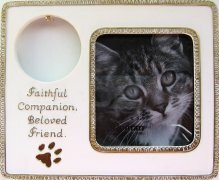 This glazed, white ceramic picture frame with gold-tone trim will hold a 3 1/2" x 5" photo of the cat. There is an area at the top left of the frame (1 3/4" in diameter) to insert to cat's id tag or a charm. The overall size of the picture frame is 6" wide x 4 3/4" high.